Bringing your brickwork back to life! 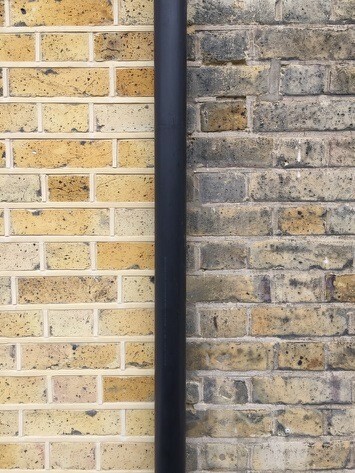 London Repointing & Restoration Ltd also offer a high finish brick cleaning service. The soiling on brickwork can be complex, it may be formed from deposited atmospheric particulates, efflorescent salts, mortar smears, paint and graffiti, bird fowling or anti pigeon gels. The water based cleaning system involves the use of cold water sprays and a hot water steam system. For our cold water system we use a fine nebulous spray system misted onto the brickwork avoiding a high pressure volume that would soften the surface. We use a special formulation of chemicals when cleaning brickwork. We wet the brickwork surface thoroughly then apply the chemicals, making sure they are not left to soak into the brickwork for too long. Finally we rinse the brick surface thoroughly. Leaving the chemicals to soak into the brickwork for longer than necessary would result in ‘white bloom’. Poultice cleaning involves the use of poultice bodies. A paste is applied to the brickwork which is then covered with a plastic film. The paste is then scraped off by hand and washed off with cold water. Specialist brick cleaning contractors with proven experience should be used for any of the above methods. They need to know the main factors of brick cleaning i.e. water contact time, water pressure, associated rinse procedure, pre-wetting procedure, chemical type and brush type.